According to Cathy Prudhomme, Community Preparedness Program Manager with the Governor's Office of Homeland Security, Registration is now open for the 2011 Disaster Ready Training Program for high school students being held June 27 to June 30, at CEC Middle College in Denver. This hands-on FREE four-day opportunity is open to all High School students throughout the front range. Disaster Ready Training is interactive learning designed to provide life-long skills that can be implemented in a wide-range of emergency situations. READYColorado and the Governor's Office of Homeland Security are sponsoring the program with funding provided by a FEMA/U.S. Department of Homeland Security Grant. Flyers and the schedule are posted online at http://readycolorado.com/disasterREADYtraining/ - space is limited!!! DEM's Training Officer, Robyn Knappe, indicates there remain several openings remaining in all upcoming National Incident Management System/Incident Command System All-Hazards Position Specific training classes to be held in Fort Wayne, Indiana. These classes are all ‘regional’ offerings sponsored by the Emergency Management Institute, and all students who attend are eligible to receive student stipend reimbursements, including potential students from Colorado interested in attending. The costs associated with travel to and from, baggage charges, and lodging costs will be reimbursed to the student by the Federal government. Potential students who are interested in attending are urged to contact Ms. Ashlee Grisel (contact information below). You can also contact Robyn directly at (720) 852-6617 or at robyn.knappe@state.co.us. people resources in the event of a disaster. As a part of the Colorado Wildland Fire and Incident Management Academy (CWFIMA), the academy will be doing one specific Federal Emergency Management Agency (FEMA) Course at their upcoming Academy session to be held in Frisco, CO, from June 6-12, 2011. The course is an elective for the Advanced Professional Series certification and given the activities already this year in Colorado associated with wildland fires and hazmat incidents, the subject is timely and appropriate for a wide range of audiences. For additional background on this course and the Academy, (dates, registration, etc), go to the Colorado Wildland Fire and Incident Management Academy site at http://www.cwfima.com. Just a note that a couple of spots have opened for the Incident Commander (COTrain Course ID - #1026070), Planning Section Chief (COTrain Course ID - #1026082) and Logistics Section Chief (COTrain Course ID - #102-6075) courses at the Western Colorado All-Hazards Conference being held in Grand Junction, April 25-29, 2011. For more information, register using the course IDs on http://co.train.org or contact Nancy Quintana. 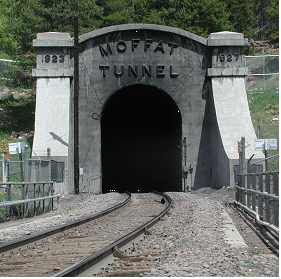 Several counties within the North Central Region have been collaborating on an exercise series at the Moffat Tunnel, which is a 6.2 mile long tunnel that begins west of Rollinsville in Gilpin County and ends near Winter Park in Grand County. The initial meetings occurred last summer with Amtrak and Union Pacific regarding a full-scale mass casualty exercise at the tunnel. Since that time, the planning team has grown to include Boulder, Jefferson, Clear Creek, Gilpin and Grand Counties, as well as the Northwest IMT, Jefferson IMT, Boulder IMT, the Foothills RETAC and the Colorado Division of Emergency Management. Amtrak and Union Pacific have been excellent partners in this planning team as well, to ensure a better understanding of the dynamics of the tunnel and the unique safety considerations involved in tunnel operations. The planning team has conducted a series of trainings and two tabletop exercises to prepare for the full-scale exercise now scheduled for Saturday, May 14th. Charlie Cox, Emergency Preparedness Coordinator for Amtrak, provided multiple response organizations a free 4-hour course on train safety and operations in August and September 2010. Following the trainings, we conducted the first tabletop exercise for all response organizations on both the Gilpin County and Grand County sides to allow them to work through various stages of the mass-casualty train derailment scenario. Amtrak, Union Pacific, Denver Water, EPA, and various other partners were on hand at this exercise to offer assistance and technical support as needed for command to make the key decisions that will be needed with a mass casualty incident involving a train derailment within the tunnel. Additionally, this tabletop exercise allowed us to move forward on communications planning and command procedures since the tunnel spans two counties with different communications systems. Because of the complex nature of emergency medical care for an incident involving a train derailment, the participants of the initial tabletop requested a second tabletop specifically centered around the EMS activities of the incident. This tabletop occurred on March 21st in Georgetown. Paul Garvey, who has been acting as the planning team’s Communications Unit Leader, provided an overview of the communications plan developed for the full-scale, as well as recommendations for long-term communications in the tunnel area. Additionally, the Foothills RETAC was able to test their Mass-Casualty Plan, which was just finalized. To prepare more fully for the full-scale exercise on May 14th, Amtrak and Union Pacific will have hands-on training available on both sides of the Moffat Tunnel in the weeks leading up to the full-scale exercise. The train will be available on the Grand County side at Tabernash, between Fraser and Granby, from May 5th through the 7th. Times for training are between 9am and 6pm each day. The train will then move to the wye at the East Portal of the Tunnel in Gilpin County, and be available for training from May 9th through May 13th, same times. The recommended time frame for the training is one hour to walk through the equipment, with more time available as needed for backboard operations or extrication. Additionally, Charlie Cox will be offering more of the 4-hour trainings on train operations and safety between May 9th – 11th. If interested in attending either the classroom training or the hands-on training, please contact Charlie Cox by email at: coxc@amtrak.com. The exercise is just about one month away from the full-scale exercise. Therefore, responder numbers are going to be more crucial. If you or your agency is planning to participate in the exercise, please contact Lori Hodges as soon as possible to ensure adequate numbers. She can be reached at 303-656-5023 or by email at: lori.hodges@state.co.us. This past week, the National Weather Service, DEM and local agencies participated in an online social media, article and discussion push for Colorado Severe Weather Awareness Week 2011. Below are links to DEM's article series, which focused on safety info as well as providing direct links to Colorado-specific information sources and alert systems. Be informed. Be prepared. Be safe.... and Have Fun! According to the National Weather Service, Lightning has killed and injured more people in Colorado than any other thunderstorm hazard. A threat not only to people, lightning strikes are a common cause of wildfires and grassfires, mostly from storms where there is little rainfall but a high number of lightning strikes. The SAFEST thing you can do? Stay indoors and away from windows during a storm. If you feel your hair stand on end, drop to the ground in a crouched position, hands on knees. Do not lie flat on the ground. Avoid being the highest object in any area. Avoid hilltops, trees or telephone poles. In a forest, move under a growth of small trees. Stay away from water during a thunderstorm. Water conducts electricity. Get off or away from open water and metal equipment (golf cars, tractors, bicycles). Drop golf clubs and remove golf shoes. Keep several yards away from other people. In open areas, go to a low place like a ravine or valley. Inside a home, avoid using the phone and unplug unnecessary appliances. Many people apparently "killed" by lightning can be revived if quick action is taken. Learn mouth-to-mouth resuscitation and CPR. First aid given should be given to those not breathing within a few minutes. If you're affected by a lightning strike, see a physician immediately. Most important, just be aware before you head out as to what the weather conditions are going to be in your area. A day where there is a 90% chance of severe thunderstorms is not the day you should challenge your first Fourteener. To keep up with weather conditions, be sure to check the NWS Colorado Weather Alerts Page, the Colorado Lightning Resource Center, and the National Lightning Safety Institute. Updates regarding the Fort Lyon Fire are being provided by Chris Sorensen with the Eastern Colorado Incident Management Team (ECIMT). The hashtag for the fire is #bentfire. Media/info line for the fire is 720-432-3411. Follow @kcdem at http://twitter.com/kcdem and @ecimt at http://twitter.com/ecimt for fire updates. The ECIMT is maintaining an incident info map for the fire (embedded below) and available online at http://goo.gl/if0J8. For more info on each of the icons, just click on them or view a larger map with legend and current status/objectives updates (top left, above map legend). The Colorado Water Conservation Board is hosting a series of on-day workshops designed to familiarize and train attendees on new resources available for improved drought planning. Topics include a review of the updates to the State Drought Plan, vulnerability assessments for regional basins, and provision of a Planning Toolbox that contains monitoring/indices guidance, drought plan guidance, sample drought plan(s), and instructions on how to conduct vulnerability assessments. If you have lived in or spent considerable time in Colorado, you have probably experienced a wind so strong that you'd swear your vehicle jumped lanes. High winds, particularly in the winter, in Colorado can be powerful enough to cause damage over a wide area, not unlike a severe thunderstorm. Why? In short, the jet stream winds over Colorado are much stronger in the winter than in the warm season. In some cases, this causes west powerful winds to race down the slopes of the Front Range, frequently in excess of 60 mph and sometimes exceeding 100 mph. High winds can cause flying debris, can collapse structures and in extreme cases, can overturn vehicles. In cases where there is a 50 percent chance or greater of high winds developing in the following day or two, the National Weather Service will issue a High Wind Watch. In the event High Wind conditions develop, the National Weather Service will issue a High Wind Warning. In extreme cases, stay in an interior room or basement of your house/business and avoid windows. Interestingly, according to high wind preparedness experts, garage doors are often the first feature in a home to fail due to high winds. Stay out of structures with wide, free-span roofs like auditoriums and gyms. Secure or move indoors all items which could become projectiles. Avoid areas/structures immediately subject to tree/branch falls (special note: pine beetle-kill forest areas are uniquely subject to blow-down due to dried or damaged root systems). And, as always, keep up with developments from the National Weather Service online or on the radio. This course is designed to provide participants with the knowledge and skills needed to design and implement an evacuation and re-entry plan for their jurisdictions. It uses a community's vulnerability analysis and evacuation plan. It also addresses evacuation behavior and recommends methods to make evacuation and re-entry more efficient. This course does not address the decision to evacuate or re-enter. Register: Registration will be through http://www.co.train.org Course ID: 1026644. This course is first come, first served. No charge. Target Audience: Individuals who may assume a supervisory role in expanding emergency incidents. The Center for School, Youth, and Citizen Preparedness (a non-profit organization) and the Colorado State Fire Chief's Association have teamed up to creat a new program, designed to pull together youth to learn, prepare for and respond to disasters. Called the Colorado Responding to Emergency and Disasters with Youth (C-READY), the program will expand upon the DisasterREADY Training that has already been implemented by the Governor’s Office of Homeland Security and READYColorado for middle and high school students. It is anticipated that students, ages 13-18 years old, will attend C-READY camp from across Colorado (escorted by advisors). These students will learn about their potential role in preparing for, responding to, and recovering from an emergency situation, and have the opportunity to put what they’ve learned to use in mock disaster exercises throughout the week. The program has the goal of teaching over 100 students the skills they need to stabilize any injuries they may have suffered before moving on to assist others during and after emergency situations until professionals arrive. Students will also learn to identify the hazards most likely to occur and reduce potential hazards in and around the home and school. They will receive training in safety and injury prevention, first aid, CPR, and the use of an automatic external defibrillator. The program also teaches youth how to respond to natural and manmade disasters and develops their leadership skills to affect change through higher education after graduation. Youth will be encouraged to lead community prevention efforts, increase their interest in health and public safety careers, and volunteer in their communities through service learning projects. The initial 5-day camp experience is planned for July 18-22, 2011 in Eagle County, Colorado. To learn more about this initiative you can visit the Center for School, Youth, and Citizen Preparedness website at: http://www.citizenpreparedness.org or the webpage put together for the C-READY initiative at: http://www.colofirechiefs.org/C-READY.htm. With epic snows comes the risk of epic flooding. It is a fact of life in Colorado that, as the snow yields to Spring, rivers and streams rise, filling reservoirs and sometimes flooding adjacent lands. Sometimes, in the event of a severe thunderstorm, heavy rainfalls, sudden breaks in river ice jams or dam/levee failures, flash floods can also strike. Flash floods are characterized by rapid rises in water levels that can hit with little warning and occur within minutes or hours. (for more on floods and flash flooding, be sure to check out the National Weather Service Flood Safety page and the Division's Flood Info Page and FEMA's Flood Safety Page). For current flood watches/warnings, be sure to check the National Weather Service Colorado Alerts Page. To stay up to speed with Colorado flood activity/threats, be sure to subscribe to the Colorado Department of Natural Resources Colorado Water Conservation Board's Flood Threat Bulletin. Flood awareness and safety is, thankfully, rather uncomplicated. If you notice water levels rising, head to higher ground. Go up. Do not attempt to cross water that is above your knees. Do not drive over a flooded road. Abandon stalled vehicles and move to higher ground. Do not become a statistic for a car. Do not attempt to outrun the flood. In the event of flooding, there are many risks - and not just with water levels. Debris, such as trees and rocks, can be carried at high speeds and surprising distances. Best to head "up" and away from places where water is moving. Better to have a good story to tell later to your friends and family about how you acted to save yourself than to be one we all watch on television. A shocking percentage of flash flood fatalities are vehicle related. One to two feet of water is enough to carry away vehicles. Too, since the water will have debris and likely will not be as clear as an alpine lake, you won't be able to see through it to see how deep it is or whether the road is damaged. Turn around or back up. It isn't worth the risk. In Colorado, there are several options to keep up with changing conditions, such as the Colorado Warnings/Alerts Page with the National Weather Service where flood watches and warnings are posted, using the Colorado NWS Radio Network, or checking regional conditions through the Colorado Department of Natural Resources/Colorado Water Conservation Board. Severe Weather - Watches, Warnings, Advisories.... Eh? It must be able to be launched those "in the know" to those in or potentially "in the area". The system must be heard by those "in the area." The message delivered must be understood by those "in the area." As far as delivery systems, in Colorado, those systems are managed at the County-level or by local first responders such as fire/police departments or local public health agencies. Alert systems come in many forms: tornado/civil defense sirens, reverse-911, text/sms/email alerts, and more. Given the huge variety of topography and weather conditions in Colorado, locally-managed systems make sense because local officials are in the best position to understand the appropriate systems, threats and population-appropriate messages best suited for their area. Behind this initial tier of alert systems is the backbone sources of info that feed local emergency responders and the public, such as those managed by the National Weather Service, who are packed with subject-matter experts in Colorado weather analysis and identification. Being heard "in the area" varies by the system. If you are within audible range of a tornado/civil defense siren, you will likely hear it being periodically tested or during an activation. If you have a landline telephone, you may be familiar with reverse-911 systems that call line-based telephones and provide incident information and safety messages. If you have registered with local emergency managers/first responders that maintain txt/sms/email alert systems, you will receive alerts on your mobile phone or internet-tied device. In addition to these official source deliveries is a robust partnership with local media sources across Colorado who work to gather and provide information during emergencies. Be sure to check with your local emergency manager to understand what systems/information sources are available and how to register to ensure you receive alerts. Of course, a message delivered is only as effective as the ability for that message to be understood. Sirens have tones/instructions with which listeners must be either educated or familiar. Reverse-911 calls will provide information regarding a specific threat and action instructions on how to protect yourself and/or your property. Text/sms/email systems will also provide information regarding the threats and what actions or where to go for further information. Generally speaking, these will all serve as spokes around a "hub" where all information regarding an incident is maintained either via a public information telephone line or, increasingly, on websites that are specific to emergencies/incidents and which are mobile-friendly. All of these systems require a symbiotic relationship between the emergency services issuer and the receiver to understand what systems are available and to remain attune to information sources and monitor conditions to ensure safety. There is no single, perfect alert system. Adequate awareness requires a mix of common sense and connection with the mosaic of information sources available. In terms of Severe Weather, the Watch, Warning and Advisory terminology has been in use for some time and continues to be relevant and adapt, even as technology evolves. Why? Because it is uncomplicated and simple, which helps it transcend systems and be used as a common message regardless of the alert system employed. It is built upon a three-tiered level of Advisory, Watch and Warning and is used to describe increasing conditions/awareness needs for Colorado hazards such as tornadoes, severe storms, heat, frost, wind, fog, freezing rain, winter storms, floods, and other weather conditions. Advisory - An Advisory is a general notice that any one or a combination of weather elements exist that may produce a severe weather condition. It is a projection that tends to be issued well in advance when forecasters are looking at data coming in that suggest or that raise the possibility that conditions related to severe weather or adverse conditions may develop. Think of the Advisory as the first "heads up" and a prompt to start paying attention. Watch - A Watch means that conditions have developed that are likely, favorable or expected but not occurring or imminent. Where an Advisory was a general indication that conditions may be forming to produce a condition or severe weather, a Watch suggests that the data coming into forecasters indicates that severe weather conditions (i.e., winter storm, tornado, severe thunderstorm, etc) are likely to develop. Watches are targeted towards specific geographic areas and serve as a notice to people in those areas that bad weather conditions are probably headed their way. Watches are a "get ready" order. Based on the type of condition, these are prompts for potentially affected persons to think about where their emergency kits are, what their home/family/business emergency communications plan is, etc. See READYColorado's site for more info on emergency preparedness kits, communications plans and more preparedness aides. Warning - A Warning means that conditions have developed and severe weather is occurring or imminent. A Warning is not a "heads up" notice it is a "take action" notice. If you are in the area of a Warning, a severe weather condition is currently affecting you or is about to affect you. In an event such as a tornado, this is the time to head to your home's safe place, to get your emergency kit, or take other response actions according to the hazard. For Colorado-specific emergency management telephone numbers, websites, contact emails and alert registration systems, we have put together a "Sources" page on our COEmergency site to help guide you to local authorities. Be Informed and Be Safe! A quick look at the National Weather Service Colorado Weather Map for today serves as a great primer for Colorado Severe Weather Awareness Week - April 10-16, 2011. 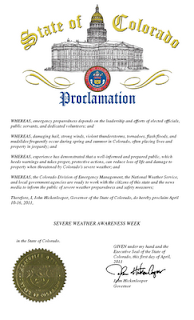 Declared by Governor Hickenlooper, Colorado Severe Weather Awareness Week is a partnership between the National Weather Service, the Division and local government services to highlight Colorado-specific conditions, weather information and resources to keep Colorado residents and visitors aware and safe. Any day in Colorado - particularly in the Spring months - we can have red flag warnings/wildfire conditions, winter storms, avalanche warnings, flooding and winter weather advisories... all within a few hundred miles of each other! For many, the snow conditions, variety of terrain and raw nature of Colorado is why we stay or come here to enjoy and call Colorado "home." With our variety of weather conditions, however, it is important to spend time understanding, learning and refreshing ourselves with weather safety. For this reason, this week, we at the Division and the National Weather Service will be posting a series of articles, links and tips to help you understand what conditions exist and how to prepare. We will be looking at each of these subjects with an eye towards hazard-specific preparedness steps you can take, such as those available from READYColorado and the wide variety of sources available to help you stay informed at the local level via radio, internet, mobile alerts and more. The Douglas County Sheriff's Office is now hiring a full-time Emergency Management Specialist. The link for the job description and application process is: http://agency.governmentjobs.com/douglassheriff/default.cfm. Deadline for applications is Wednesday, April 20, 2011 at 4:00 PM Mountain Time. Eastern Colorado Incident Management Team - Application Period "Open"
The application period for the Eastern Colorado Incident Management Team (ECIMT) is now "Open". All individuals applying for positions as primary, job share or trainee, must submit an ECIMT Team Roster Application Form and a copy of their current fire training, all-hazard training certificates, current task book status and experience record/red card documenting their qualification or a copy of a complete IQS. In addition, all applications must be approved by the applicant's immediate supervisor. Applications are due by April 30, 2011. For questions or more information on the ECIMT, contact Chris Sorensen at chris@kiowaoem.com. It defines National Preparedness, Security, Resilience, Prevention, Protection, Mitigation, Response and Recovery. For information regarding the the Crystal Fire in Larimer County and associated evacuations/shelters, information is being posted on Larimer County's News Release page at http://www.larimer.org/news/news.cfm and on Larimer County's Emergency Services page at http://larimer.org/emergency/emergency_detail.cfm?nam_id=73. Larimer County (@larimercounty) officials are also posting updates to http://twitter.com/LarimerCounty, Larimer County's Facebook Page, and via Larimer County's RSS Feed. Users can also subscribe to receive Larimer County Emergency Information Email Updates. You can also receive txt/sms updates on your mobile from Larimer County by texting follow larimercounty to 40404. Crystal Fire Info is also on Inciweb at http://inciweb.org/incident/2161/. The public affairs staff of the Arapaho Roosevelt National Forests and Pawnee National Grassland (@usfsarp) is also posting updates on their Twitter Feed regarding the Crystal Fire at http://twitter.com/usfsarp. The Rocky Mountain Area Coordination Center is also providing information and can be found @rmaccfireinfo at http://twitter.com/rmaccfireinfo. The public information line for Larimer County Emergency Management is: (970) 498-5500. Shelter information is being provided by the Red Cross at http://ht.ly/4s741. The Red Cross (@redcrossdenver and @nocoredross) is also posting updates regarding shelters online at http://twitter.com/redcrossdenver and http://twitter.com/nocoredcross. The Colorado Department of Transportation (CDOT) will be closing both directions of Interstate 70 at Georgetown Hill for one or two days, starting at 9:00 a.m. on Tuesday, April 5, 2011, for a large-scale rock removal operation. For text and/or email alerts about the project and while work is underway, please visit http://www.coloradodot.info and click on the cell-phone icon in the upper-right hand corner. A link takes you to a list of items you can subscribe to, including I-70 West, Denver to Glenwood Springs. Updates will also be available by calling 511 or by checking the web site http://coloradodot.info. The Colorado Department of Transportation also maintains a Twitter feed (@coloradodot) at http://www.twitter.com/coloradodot. The National Wildland Coordinating Group is currently in the process of revising the Fireline Handbook and is seeking user input. In particular, the Operations and Workforce Development Committee (OWDC) understands the Handbook's use has evolved more towards a standards guide than a simple reference tool for firefighters. The NWCG is, therefore, soliciting wide comments from users of the guide in the wildland fire community. To participate in the survey and share your insights/thoughts, submit your input online to https://www.research.net/s/flhb. Comments/input is due by Friday, April 8, 2011. The Kiowa Fire Protection District is hosting a Grant Writing Course for first responder and public safety agencies on May 21-22, 2011, in Kiowa, CO. For more info on the course and registration, go to the Course Web Page or contact Tim Rossette, EMS Division Chief at (303) 621-2233 or at t.rossette@kiowafire.com. On May 6, 2011, Mesa County's Communications Officers' Association is hosting a Spring Retreat in at the Ute Water Conservancy District in Grand Junction, CO, from 8:30 a.m. - 3:00 p.m. The retreat is "open" and intended for public information/relations individuals. The meeting agenda is robust and will cover crisis communications, incident after-actions, work-life balance, and social media in emergency management issues. For more on the retreat, speakers and for registration information, check out the Mesa County Communications Officer Site and the Spring Retreat Flyer, or contact Kayla Arnesen via email at kayla.arnesen@rmhp.org.